We woke up quite early in the morning when the sun had just risen. Then Indi took Noe for a walk along the streets of Cuernavaca while I downloaded the photos we took yesterday into the laptop and did the blog entry. 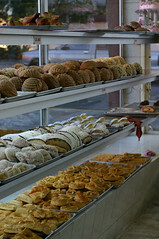 One hour later Indi returned to the hotel with a bag full of fresh warm bread (pan dulce â€“ traditional Mexican soft sweet bread), butter, and hot coffee. What a perfect breakfast! Then we prepared ourselves to check out of the hotel. I turned on the TV, and wow, how the TV shows were similar to Indonesian TV show. There are a lot of celebrity gossips. In the news segment, there is news of landslide in West Sumatra. Itâ€™s incredible how bad news on Indonesia always gets to the other side of the world really fast. Carlos and Yodhi woke up a bit later just when Indi, Noe and I just got sleepy again. While waiting for Carlos and Yodhi to get ready, we took a walk to the town again, where Indi bought the sweet bread. There, Rani bought a liter of sweet papaya juice to help with her digestion. We also bought some tostadas (crispy baked taco) for Noeâ€™s breakfast and coffee for Carlos. After checking-out La Rossa hotel, we drove to Tepoztlan, an old town 80km South of Mexico City surrounded by high, jagged cliffs. 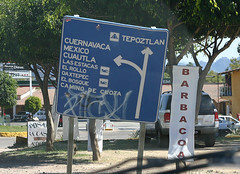 We drove through country road rather than expressways, exposing us to village landscape of Mexico. A lot of roadside food sellers can be found along the way, as well as people providing auto services. 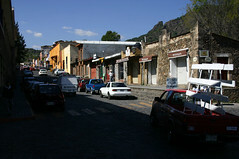 Tepoztlan was a legendary birthplace, more than 1200 years ago, of Quetzalcoatl, the omnipotent serpent god of the Aztecs. 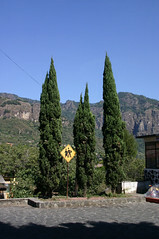 The town retains indigenous traditions, with some elders still speaking Nahuatl, and younger generations learning it in school. Considered as an international post-hippie Mecca, Tepoztlan attracts people of all kinds, including those who are encouraged by UFO sightings. 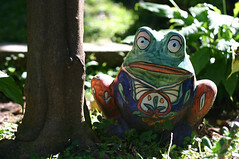 Some said that the place is full of creative energy and we believe so. This town really fascinated us by its clean and simple streetscapes with occasional rustic walls. Shops full of local made handicrafts as well as from South and East Asia seem to have decorated the inner walls of the blocks. 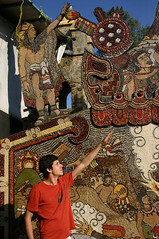 We visited the cathedral of Tepoztlan, where the gate was decorated with seed mural. It was really intricately made from corns, beans, and other kinds of seed. However, the mural depicted the story of Spaniards conquest against the Aztecs, which we think is a rather sad story. Montezuma was depicted on par with the Spanish leaders, which Indi thinks is rather awkward since Montezuma was much more advanced in his governance, providing leadership to over 1 million population at that time. Not only did we love the built environment of this town, but we also were very impressed with their local delights such as the one we visited in the marketplace. 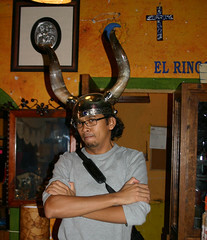 Antojitos is what they call the Mexican â€œwarung tegalâ€ where ready cooked meals are served in front of you. You just have to point at what you want and they will mix them in fresh soft tacos made from blue corn (making them look grayish). I actually had it inside my taco filled with char-grilled beef and cactus. The cactus tastes like bitter gourd, but not bitter. Itâ€™s very chewy and refreshing. 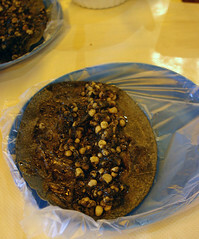 We also ordered taco filled with Huitlacoche (which is actually made from diseased corn). The tacos are all eaten with hot salsa. There were many kinds of salsa, from a very mild salsa verde to the very hot orange coloured salsa made from a kind of habanero. For the drink, we ordered Mamey juice. 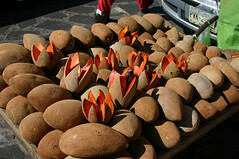 Mamey is a kind of chico/chiku fruit, with the same brown skin, but the inside part is of reddish orange color. The taste is sweet, just like chico, but more starchy. It turned to be very well combined with milk, the taste is just like malt vanilla smoothie milk shake with a bit of fresh taste. 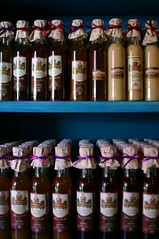 We continued to walk along the market, and got inside a shop that sells various kinds of tequila mix. Rani really liked the eggnog like tequila mix with a taste of eggyolk in it, which is called rompope. The various tequila shots we sampled in a store in front of the monastery really whetted our appetite. 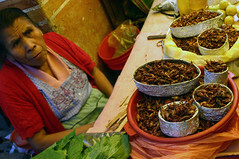 At the market, Indi ate grilled spicy crickets on its own and so did Yodhi. Later in the afternoon, we managed to find a internet cafÃ© that charges only 5 Mexican pesos (S$0.70) per hour with quite a speedy connection. Thatâ€™s where I uploaded the first set of photos from this trip. A coffee shop that Carlos and I bought the coffee from made a silly mistake of charging us twice at 26 pesos. After a lengthy argument, Carlos managed to get his money back but he swore heâ€™d never return to that place again. I could not even remember the name but the coffee was too acidic for Indiâ€™s sophisticated tastebuds, anyways. But according to me, the coffee is just fine. In the evening just before sunset we drove to Mexico City and checked into an apartment that belongs to Emmanuel Marquez (Carlosâ€™ older brother) who is an actor and also a puppeteer. His place in near Casa Estudio Luis Barragan, a famous Mexican Architect that Indi adores. His place is a two bedroom apartment with nicely decorated rooms. We have not met Emmanuel but we could sense that heâ€™s a brilliant person after having seen his short video performing Fausto puppet show. He is now traveling in Eastern Europe after having completed a series of theatrical performances. We took a quick nap just before dinner at Sanbornâ€™s which is located inside a 16th century building called La Casa de los Azulejos / House of Tiles / Blue Palace, in Centro Historico district with Gabriela, a dear friend of Carlos who is an expert in theater wardrobe design. She is a very expressive person who loves to sing and regularly performs on radio shows. She designed the costume of Carmen opera which was performed by the National Opera of Mexico. She shared the stories of the technicalities of designing and making costumes. At Sanbornâ€™s Yodhi had experienced the richness of Mole (which is something close to satayâ€™s peanut sauce but definitely more robust). 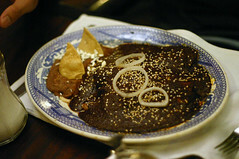 According to Gabriel and the lonely planet book, Mole is made from 27 types of spices, mixed with many kinds of peanuts and nuts, and of course, a dash of chocolate. The taste is really similar to satay sauce, a bit sweet and nutty. A perfect dinner is not yet complete without a nice walk along the main Plaza de la Republica where millions of Mexicans would gather. What we saw there at midnight was amazing. There was a vast plaza built on top of where where the heard of Tenochtitlan was. In fact, there are plans to gut the concrete pavement out of there, dig deep enough to reveal the remains of Tenochtitlan and then put one layer of transparent glass where people could see it from above. What a brilliant idea to bring Tenochtitlan back to life after experiencing a complete and systematic destruction by the Spaniards centuries ago. There were a lot of food peddlers in the main square, including hot dogs and boiled corns. 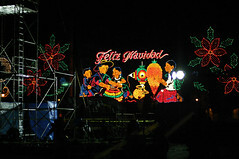 The plaza was totally nicely decorated with lights to celebrate Christmas and new yearâ€™s eve. A massive Christmas tree was still being installed. We bought Noe a balloon for 10 pesos, but Noe was crying because the balloon kept flying up. Since Noe was tired we then decided to go home. Gabriela promised to take us to see political demonstration next Tuesday to oppose the current president who got into his position with electoral fraud. The demonstration is supposed to be very peaceful and many people actually took their kids along. Weâ€™ll see how it goes on Tuesday.